One of the greatest maritime exploration mysteries solved! HMS Erebus and HMS Terror went missing after Sir John Franklin and his crew searched for an access route through the Northwest Passage in 1845. The ships and their crew never returned home. The mystery behind the fate of the crew and the two vessels is one of the biggest in marine history – until now as we begin to unlock the story with modern research and expeditions in the Arctic. Did you know One Ocean Expeditions was involved in this search to help locate the HMS Erebus? The search for these vessels helped chart what is now Canada. Over time the searches have turned up scarce traces of evidence to piece together the mystery, until enough evidence was found to start another search – this time with success. In 2014, One Ocean Expeditions partnered with the Government of Canada, Royal Canadian Geographical Society and several private partners in one of the largest combined search efforts to date. 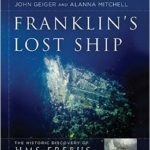 resulting in the find of Franklin’s HMS Erebus in the Victoria Strait Expedition 2014. One Ocean Expeditions provided a vessel, One Ocean Voyager – Vavilov, to support the search. The One Ocean Voyager was carrying Parks Canada’s ROV (remote operated vehicle) and their AUV (autonomous underwater vehicle). The AUV has a state-of-the-art sonar system that was deployed in order to scan the seabed in search of the Franklin vessel and was key in this incredible discovery. The HMS Erebus has been resting on the ocean floor in near perfect condition for over 160 years. The search is not over as the HMS Terror is still missing. Avid explorers such as Louie Kamookak are still searching for artifacts of the famous expedition. Learn more about Louie’s Humahuk Expedition as he travels through the Arctic. Join us on an Arctic voyage to walk in their foot steps and visit the place of Franklin’s 1845 winter home.